Having had the experience of public art with no public involvement, a community organization in Albany, New York, set out to show there could be another way. In a way, it all began with the squirrel. 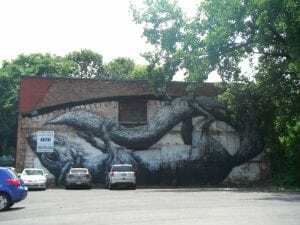 In 2011, Living Walls Albany brought internationally renowned street artists to the humble little capital of New York to do their magic throughout the city, echoing the several-years-running Living Walls Atlanta festival. It was described as a coup for a place that, while beloved by its residents, is, outside its own region, generally considered a destination point primarily for lobbying and protesting. For the event, about a dozen building owners gave permission for artists to work on their walls. The idea of soliciting community input was also bandied about, but in most if not all cases, it wasn’t. While many of the pieces were welcome, others were not. A gory painting of a caribou being attacked by wolves was painted over by the building owner almost immediately. A portrait of Nelson Rockefeller, who as governor instigated the wholesale demolition of a large neighborhood in the heart of the city to construct a massive marble government office complex, seemed somewhere between tacky and offensive to those who knew their local history. And then there was the painting done by Belgian artist ROA, known for his black and white renderings of animals, often dead. His wall was the side of an old stable building in the Sheridan Hollow neighborhood, nestled at the base of a steep hill just below the state capital. It is an old and storied neighborhood. Beaver pelts were tanned in the stream that ran along the base of the hill 400 years ago. One of its back alleys was actually a road on which George Washington marched to the battle of Saratoga. It is also a neighborhood that has suffered too many of the familiar ills that stem from redlining and racial discrimination—vacancy, disinvestment, and unequal city services—and resistance to them. In the 1980s residents successfully organized to shut down a garbage incinerator whose pollution was plaguing the valley. That fight launched the Sheridan Hollow Neighborhood Association. (Incidentally, it also launched the connection between environmental justice activist Aaron Mair and the Sierra Club—today Mair is the first African-American president of the national organization.) More recently, a photo from the neighborhood was used to represent “blight” on Jeopardy. So when at the height of the foreclosure crisis and Great Recession, neighbors discovered a massive mural of an apparently dead squirrel on a building near their main park, many of them were not amused. We have enough real rodents to deal with in this neighborhood, they muttered, without some artist adding a giant one. Across the city, “the squirrel” quickly became shorthand for a distaste of drive-by art by outsiders. “I hated that squirrel. Hate, hate, hated it,” says Lissa D’Aquanni, the communications director for the Community Loan Fund of the Capital Region (CLFCR), whose offices are a few blocks from the squirrel. She thought they could do better. CLFCR is housed in a building with a group of other community development nonprofits. The building, which also functions as a small-business incubator, is owned by the Albany Center for Economic Success (ACES), a subsidiary of CLFCR. ACES also owns a corner lot next door. D’Aquanni thought the wall facing the lot would work well for an uplifting mural, but initially she couldn’t get the ACES board excited about the idea. The building needed other work at the time, and artwork wasn’t a priority. Looking back, she recognizes that her first proposal also didn’t have a compelling enough community component behind it. There was a sketch that involved musical notes, she recalls, but people didn’t get the symbolism, and there was no buy-in. 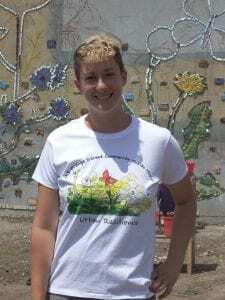 But in 2015, D’Aquanni and Destiny Watkins, then CLFCR’s training and technical assistance associate, now a lending officer, met artist Jillian Hirsh, who was completing a mosaic mural in the neighboring city of Troy. This, they thought, felt right—a mosaic could involve many hands contributing, bringing a feeling of ownership to the results. They had no idea just how many hands would end up being involved. “We couldn’t have another thing where an artist comes in and puts this mural up and the neighborhood doesn’t buy in,” says Watkins. So Hirsh, who strongly values community engagement, was a good fit for the project. When she agreed to take on the project, her first step was to attend some regular meetings of the Sheridan Hollow Neighborhood Association. “At the first few I introduced myself, but didn’t say much,” she says. “It was more about listening, observing.” She listened to residents talk about the squirrel mural, their memories of the neighborhood, and their hopes for it. “It wasn’t until December  that I started working with the neighborhood association on concepts and having a back and forth,” she recalls. The process was slow and deliberate enough that neighborhood association President Roy Conrad remembers feeling frustrated, like there was a lot of talk about the idea, but little movement. Nonetheless, he’s thrilled with the result. Knowing that the dozen people who come to neighborhood association meetings couldn’t represent the neighborhood entirely, Conrad said the association also took the idea to church block parties, Neighborhood Night Out, and the neighborhood holiday party where the Toys for Tots presents are handed out. In each place, they explained the idea, and gave community members a chance to experience making tiles out of clay that would end up on the wall. At the neighborhood holiday party, Hirsh presented three sketches based on the theme of urban resilience, focused loosely around flowering weeds that live in the neighborhood, bees, and butterflies. “We were like kids in a candy store,” recalls Conrad. “They were all gorgeous.” Everyone present voted with Post-It notes, and due to a tie, Hirsh combined several ideas into a composite sketch, something she notes as one example of where community input pushed her to a decision she would not have made on her own. While the design process had stayed fairly tightly within the neighborhood, the creation of the mosaic itself became a citywide, or even region wide, endeavor. First step: thousands and thousands of tiles. And what better place to find lots of eager hands that want to work with clay than in the schools? Watkins says one of her interests in her training role with CLFCR was youth entrepreneurship, and she’d been looking for a way to make connections in the schools. 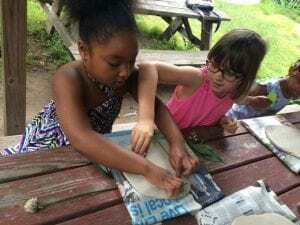 In the summer of 2015, CLFCR held a pilot tile-making project in a summer program at a local elementary school with teacher Michelle Bridgewater and potter Liz Vigoda. It was such a success that Bridgewater connected CLFCR to Kate Wright, the chair of arts for the Albany City School District, so the project could be brought to a few more local schools during the year. Wright brought CLFCR to the districtwide Arts Advisory Council to pitch the idea to the art teachers, who were enthusiastic. She also helped identify and write a grant for supplies and professional development with Hirsh. Starting in January 2016, classes in every school in the city—from kindergarteners with cookie cutters to advanced sculpture classes at the high school working in relief—made tiles. Some were shaped like bees or butterflies or other relevant designs; others were “breaker” tiles covered in patterns that could be broken once fired in a kiln to make the pieces needed to fill in the mural shapes. Each class had its own glaze color and theme to ensure the needed variety. Only a few elementary schools in the district had kilns, notes Wright, but the teachers took on transporting the tiles to the ones that did. “The kids just loved working with clay,” says Wright. “My main worry was that especially the little kids wouldn’t want to let their artwork go.” She prepped her students ahead of time for this, telling them they could visit the mural and see their artwork there for years to come. Hirsh, who studied art education, trained the teachers and visited some of the classrooms herself. She talked with kids about local nature and the lifecycles of butterflies, and also held tile-making workshops with a wide range of other stakeholders from neighbors to CLFCR board members. Then, all throughout the summer of 2016, volunteers—some who had made tiles, some who hadn’t—showed up to help attach mural pieces within the lines Hirsh had sketched on the wall. Police officers, elected officials, and summer youth employment program participants rubbed shoulders. One young woman who lived nearby stopped in nearly every day on her way home from her summer job to apply tiles to the wall. While the artists were soaring high, CLFCR was dealing with much less transcendent issues. For example, Watkins explains, “once the lot was mowed we discovered there was no sill plate under the wall, there was no beam supporting the wall in the garage.” The wall needed to be stabilized, mural or no, but “had we not done this mural project we wouldn’t have known until something happened.” The problem, Watkins says, is “all the grants we got had to go toward artists, art supplies.” Turns out, it’s a lot easier to get funding for a mural than it is for emergency wall reinforcement. “It was a hard year,” acknowledges D’Aquanni. Eventually local philanthropist Charles Touhey stepped forward with part of the needed funds, and CLFCR’s development committee fanned out to talk to banks. CLFCR applied for state money, and after Assemblyman John McDonald suggested the group talk to people at health insurance companies, D’Aquanni found an advocate in MVP Health Plan’s Ellen Sax, who opened other doors to hospitals and financial institutions. Within a few tiring weeks, through a string of $500 to $2,500 donations, the rest of the cost of the wall repair had been raised. So what had been a mural project now became a full-scale green space renovation project. CLFCR, having reached out for donations, was surprised to be adopted as a Lowe’s Local Heroes project by several local stores, which meant volunteer labor along with materials to clear out, re-fence, and landscape the lot, and add raised beds of native flowering species. It took a half-dozen volunteers three solid weeks of work to prep the lot. The glittering Urban Resilience mural—unveiled in September 2016 to much fanfare—and the property it overlooks has been named the Sheridan Hollow Commons. The commons, as its name suggests, is intended to be a community space. CLFCR is still working out the details of who can use it, when, and how. It’s not a park, but not a private space either, and so far the area is staying unlocked throughout the day. Standard contracts for space usage require insurance, D’Aquanni notes, but that would make it inaccessible for neighbors. She is pretty sure that community events will have free use of the space. Staff will also go back to the neighborhood for input on programming, and they are considering adding a stage. All of this was new to CLFCR, a community development financial institution that makes small business and nonprofit loans across an 11-county region and offers training and technical assistance to small business owners. Through its connection to ACES and the building, it has been involved in supporting local planning efforts in the neighborhood in the past, but it’s not usually an organization that plans and executes community-based projects of its own. That meant there was a huge learning curve. But it also meant that CLFCR built a raft of new relationships with potential borrowers and supporters in places it had never reached before. Not only the public schools, but a few private schools and some African-American social groups, including Delta Academy and Jack and Jill, participated in tile-making and tiling days, for example, as did many funders and elected officials who had not been connected to the CDFI’s work before. In fact, the project got to be so big and beloved by so many high-profile people that it made Hirsh a little uncomfortable at times. “There are different layers of community, and the idea of community is very ambiguous,” she admits. “Like the neighbors across the street, it was so nice that they helped with the project, that they feel ownership. [Those are] the most important community partners. Then it radiates out. The broader that swath gets, the less of a connection to the physical mural itself. If it was left up to me, I would have had less [tile-making] workshops, but more intimate workshops.” She’s quick to add though, that the broad involvement was “still better than this thing happening as something exclusive” and not involving the local residents at all. Conrad, however, didn’t mind the region-wide involvement, even when SUVs from the suburbs were driving by to see the completed mural that had been in the paper. “It felt fantastic having the greater Albany community involved,” he says. “They got to see this is Sheridan Hollow. We were in the news for something positive.” He feels like the coverage has even gotten the neighborhood association more political credibility at the city level, more likelihood to get a seat at the table. Also, somewhere along the way, someone painted over the squirrel mural. “No one says ‘I miss my squirrel,’” says Conrad, wryly. “We included it in all our [fundraising] presentations,” remembers Watkins, and they even walked some of the suburban volunteer groups down to see it and discuss whether it would ever have been put up in their neighborhoods. In addition to her job as editor of Shelterforce, Miriam Axel-Lute sits on the board of the Community Loan Fund of the Capital Region, made one tile, and placed the tiles for one dandelion leaf on the Urban Resilience mural, but was otherwise not involved in the project. I’m an Albany native and lifetime resident, educated by the Albany public schools and graduated from 2 of our local colleges for art and art education! I’m an artist and teacher; a person who likes to give back to my community. I have wanted to be involved in community art projects for years, but how? Who do I talk to?